With vast golden beaches, towering cliffs, remote coves and sleepy estuaries, Cornwall boasts some of the most varied and spectacular coastline in the world. Add that sunrise on the south coast and sunset on the north are just a few miles apart, and you have the ideal destination for seascape photography. That's why I moved here in 2013 to widen my seascape horizons and nurture my love for this spectacular form of the photographic art. 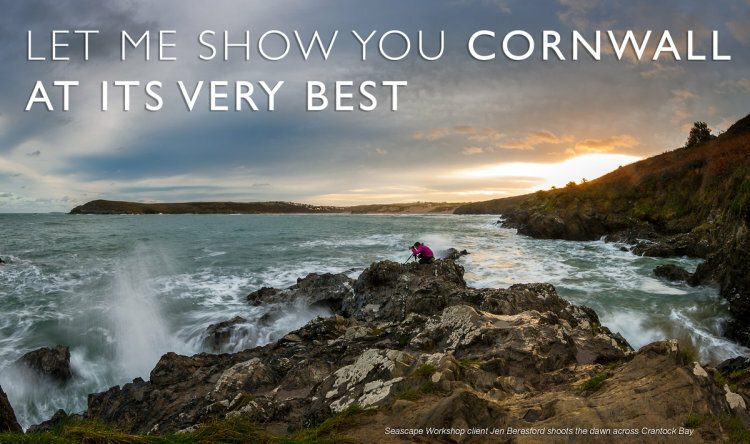 As a natural extension to my commercial work, I combined this passion with my professional skill set, to create Cornish Seascape Workshops - a unique, residential photography course for a solo individual, or couple. Based at my home/studio in the coastal village of Crantock, this course is unlike any other. Rather than group 'workshop' tours, where others dilute the tuition. Or day trip 'workshops' that deliver little in terms of location diversity and in-depth insight. My one-to-one workshop sees just you immersing yourself in your photography over a number of days. You chose for how long but on the course you will witness stunning locations. Master new camera techniques. Capture superb images and learn a flexible, progressive approach to processing that refines your RAW files to the optimum standard. For my part, I will always ensure the locations suit and the tuition is delivered to match your level of experience, so that it all sinks in. Exclusivity - The focus is solely on you. There's no group. So we get the tideline to ourselves and back in the studio you have my undivided attention. In terms of exclusive one-to-one guidance, my workshop is unmatched. Experience - I have experience of exploring Cornwall's coastline for over 40 years. So I can match tide and time with your aspirations and comfort levels, to ensure we are at the ideal location at the right moment. 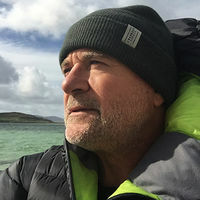 Expertise - My award winning seascape approach is forged on expertise gained in a 30+ year career in London's advertising and design scene. I was at the birth of the digital studio and have been using Adobe Photoshop professionally since 1990. Today, I preach capturing the image 'in camera' and refining it using fine art processing techniques to achieve gallery quality results. CLICK HERE to view my photography website. Excellence - I strive to deliver excellence in quality of tuition and course attributes. So your all inclusive package reflects this. You will be driven in a Land Rover Discovery 5. Use 27" Retina Display iMac Pro's running Photoshop CC. Enjoy comfy en-suite accommodation in a large, modern house and dine from a menu planned around exactly what you like to eat. While we will shoot spectacular locations right around the Cornish coasts, Crantock Bay is just down the lane. The BBC Coast programme voted it Britain's Best Beach in 2014 and it was recently placed at the heart of a newly founded Marine Conservation Area. It is a fantastic place that boasts a host of shooting aspects at all times of the day, tide and season. Spring - March, April, May - A time of coastal regeneration with vivid colours, bright skies and warmer days. The sea takes on turquoise hues as the sunlight strengthens and wild flowers carpet the cliffs. Spring strikes a balance between balmier days and shooting the blue hours at 'sensible' times. Summer - June, July, August - This time of year can be very rewarding. Yet the attraction of warm, sunny days capturing glorious sunrise and sunsets, needs to be balanced with early starts and late returns. This means daytime routines work around much needed breaks to catch up on sleep. 2 or 3 days is the ideal Summer workshop length. August calls for remoter locations to avoid holidaymakers. Autumn - September, October, November - Peace descends and the shortening days can be sultry and colourful. Dawns and dusks are often accompanied by breathtaking atmospherics. A wonderful time of year and my busiest, so book early! Winter - December, January, February - The wild season where brooding, stormy atmospherics can be magnificent. Our chilled, windswept beaches are all but deserted and an Atlantic storm sees the coast at its best. This is also a good time for longer studio sessions and getting to grips with advanced post processing and printing techniques.